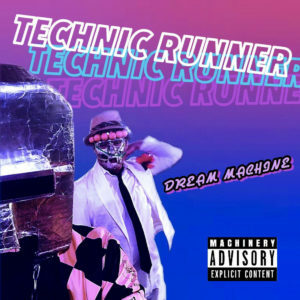 Duo Technic Runner have been popping up on the Tokyo live circuit for a few years now, releasing songs as far back as four years ago and popping up at Scum Park events around the same time. Their style has mutated over the years, last seen with a nervy EP splitting the difference between Group A and Nature Danger Gang. Dream Machine, their newest EP, finds the masked pair explicitly experimenting with trap music. What could be a big misfire ends up being a solid release, mainly because Technic Runner offer such a charming perspective on the style. Opener “Tetsu No Knuckle” features a chanted hook, ad libs galore, and even a few “skrrts” for good measure, but it’s all set against this squiggly music that brings to mind group_inou’s explorations rather than a Migos-rip. It’s when they let this rinky-dink homemade feeling come through they shine the most, as on the title track and on “Detroit,” nodding to the titular city with some acid-house splashes. Get it here, or listen below.